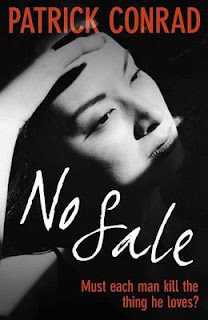 NO SALE which was published in English in 2012, was originally published in Dutch in 2007, and is set a few years before that. What it does reveals is that Cox is a man who sees life in terms of old films. Appearances, actions can all be linked to Hollywood. The police release Cox and time passes he forms a relationship with a film student who looks like silent movie stars Clara Bow and/or Louise Brooks and then another death occurs: a woman is killed by a knife in the shower in a motel room. There have been other unsolved murders but Luckyx is stumped. Is there a serial killer on the loose? Why is Professor Cox always connected somehow to the dead women? NO SALE is not a police procedural, though the police duo feature, most prominently at the beginning and end; it's about Victor Cox, and his life-long obsession with movies. Is he sane? Is he a killer? Is he innocent? It's told in fairly short chapters, each one titled with the name of a character, either a fictional one or a real actor. I found it a fascinating read as I'm interested in films and movie-stars, and some of the old scandals are mentioned as well as lots of film names. By coincidence I'd just watched a BBC4 Arena programme about 'Screen Goddesses' so the names Clara Bow and Louise Brooks meant something to me. The storyline itself is also intriguing as it's not clear how much is the truth and how much is a dream. It's neatly plotted and if I don't think the ending quite lived up to what came before it then that's a minor quibble really for such an interesting reading experience. This is an unusual crime novel, and worth seeking out; the latter is something I could write about every Bitter Lemon Press novel I've read so far. Karen - I agree about Bitter Lemon Press. They've released some terrific and fascinating books. And this particular novel does seem like very much a worthwhile read. I think the Hollywood theme is innovative and clever too.